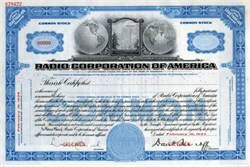 Beautifully engraved RARE SPECIMEN certificate from the Radio Corporation of America dated Fedruary 20, 1933. 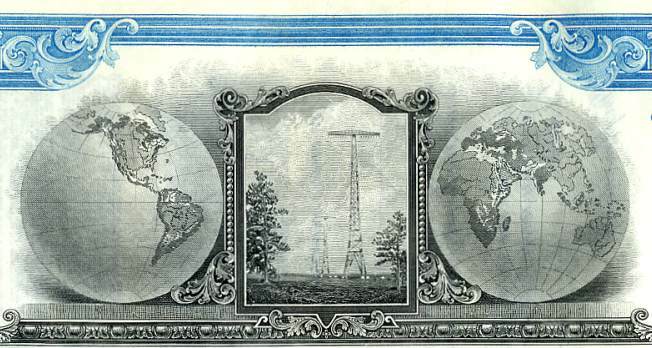 This historic document was printed by the American Banknote Company and has an ornate border around it with a vignette of two world globes on both side of towers . This item has the printed signatures of the Company�s President ( David Sarnoff ) of the Board and Secretary ( Lewis MacConnach ). This is a RARE SPECIMEN. The Radio Corporation of America (1919-1986) was organized as an American monopoly of radio technology by General Electric Company. After World War I, the United States Navy encouraged GE to buy the Marconi Wireless Telegraph Company of America from its parent company in England. Its assets included the country�s only radio stations, hundreds of installations in ships, and David Sarnoff. David Sarnoff (1891-1971) was a corporate manager and executive and he became technology's champion, especially for broadcast communications, starting at the age of fifteen. He advocated, supported, financed, and oversaw the development of radio in the 1910s and 1920s, and then television from the 1930s through the 1950s. On April 14, 1912, Sarnoff was working at the Marconi station atop Wanamaker's department store when he picked up a message relayed from ships at sea: "S.S. Titanic ran into iceberg, sinking fast." For the next 72 hours, the story goes, he remained at his post, giving the world the first authentic news of the disaster. Sarnoff first posed the concept of broadcast radio in 1915. At that time, more than half of the American population lived in towns of less than 5,000 people; information arrived through newspapers, magazines, mail order catalogs, letters and postcards, and word of mouth. Today, there are nearly 13,000 AM and FM radio stations in the United States, and thousands more abroad, as well as nearly 20,000 internet radio stations. Sarnoff formally introduced RCA's electronic monochrome television system in 1939 and the world's first electronic color television system in 1946. In 2000 there were over 1,600 television stations in the United States. Only since 1990 have more households acquired complete plumbing facilities than televisions. Some 900 million people watch color TV around the world, and the color picture tube used for television and computer displays was invented at RCA Laboratories. 1939 Introduces TV broadcasting to the U.S.